From the team that brought you SparkPeople.com, America’s #1 weight-loss and fitness site, and the New York Times bestseller The Spark, comes The SparkPeople Cookbook. This practical yet inspirational guide, which is based on the same easy, real-world principles as the SparkPeople program, takes the guesswork out of making delicious, healthy meals and losing weight—once and for all. Award-winning chef Meg Galvin and SparkRecipes editor Stepfanie Romine have paired up to create this collection of more than 160 satisfying, sustaining, and stress-free recipes that streamline your healthy-eating efforts. With a focus on real food, generous portions, and great flavor, these recipes are not part of a fad diet. They aren’t about spending money on obscure ingredients, eliminating key components of a balanced diet, or slaving away for hours at the stove. They are about making smart choices and eating food you love to eat. But this is more than just a collection of recipes—it’s an education. The SparkPeople philosophy has always been about encouraging people to achieve personal goals with the help and support of others. And this cookbook works in the just the same way. Along with the recipes, you’ll find step-by-step how-tos about the healthiest, most taste-enhancing cooking techniques; lists of kitchen essentials; and simple ingredient swaps that maximize flavor, while cutting fat and calories, plus you’ll read motivational SparkPeople success stories from real members who have used these recipes as part of their life-changing transformations. · Quick and tasty “Make It a Meal” suggestions to turn every main dish into a well-balanced meal. · Results from the SparkPeople “Ditch the Diet” Taste Test, which proves that you don’t have to eat boring and tasteless food to lose weight. · 150 meal ideas and recipes that take 30 minutes or less to prepare—plus dozens of other, more elaborate meals for days when you have more time to cook. · Two weeks of meal plans—with breakfast, lunch, dinner, and two snacks—all within 1,400–1,600 calories per day. So whether you’re a novice taking the first steps to improve your health or a seasoned cook just looking for new, healthy recipes to add to your repertoire, this cookbook is for you. Learn to love your food, lose the weight, and ditch the diet forever! 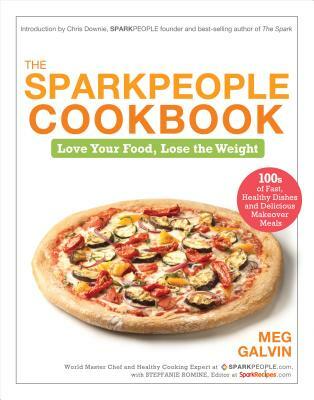 At SparkPeople.com, Meg Galvin develops healthy recipes, tests member-submitted dishes, and teaches the fundamentals of cooking through informative and entertaining videos and articles. A World Master Chef since 2005, Chef Meg was the host of the regional television show The Dish, which aired on a local CBS affiliate and online. Meg now hosts cooking videos on the local FOX affiliate. Galvin earned a bachelor’s degree in business administration from Eastern Kentucky University and a certificate of culinary arts from Le Cordon Bleu in London. She is certified as an executive chef by the American Culinary Federation and is working toward her court of master sommeliers wine certification. Galvin is a faculty member at Cincinnati State Technical and Community College. Galvin now lives in northern Kentucky with her husband and three teenage sons. Stepfanie Romine is editor of SparkRecipes.com and dailySpark.com, SparkPeople’s healthy living blog. With degrees in French and journalism from Ohio University, Romine started her career in newspapers—first as a copy editor; then as a business reporter, food blogger, and columnist. She joined SparkPeople in 2008, thus marrying her passions for writing and healthy living. A vegetarian and runner, Romine has studied ethnic cuisines on three continents. She is a longtime practitioner of Ashtanga yoga and became a certified yoga teacher in 2009. Romine lives in Cincinnati, where she and her boyfriend fuel long runs and bike rides with healthy homemade meals. SparkPeople.com is one of the leading diet, fitness, and healthy living destinations on the web, with more than ten million members; free weight loss, nutrition, and fitness tracking tools; and a positive community of people who are committed to reaching their goals and supporting one another along the way.